Today I got the first Maho Shojo Lyrical Nanoha StrikerS R2 DVD in the mail. Even though I haven’t watched it properly yet (I plan on doing so tomorrow) I can say I’m already impressed. Usually Japanese DVDs are little more than improved video tapes: they provide just the bare minimum (and not for a cheap price). However, this is not the case with Nanoha StrikerS. A nice A4 poster with the young and older Nanoha was also present with the DVD. I cant’ really show images of that as it’s too big to fit on my scanner, and I am not too well versed in stitching partial scans together. What about the content? It has been known (and posted elsewhere) that the animation has been redone in a few places. I need to verify that personally, so expect updates in the next few days. 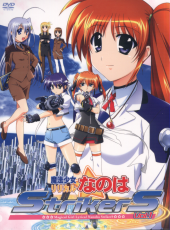 What I know is that the DVD also contains extras (another rare thing in the land of the rising sun), mainly an interview with Nanoha and Subaru’s seiyuu, along with footage from a Nanoha event. So, what to say up to now? I’m pleasantly surprised that for a change this DVD provides some extra value for its money (5,800 yen isn’t cheap). I will be sure to follow up with opinions on the content itself.